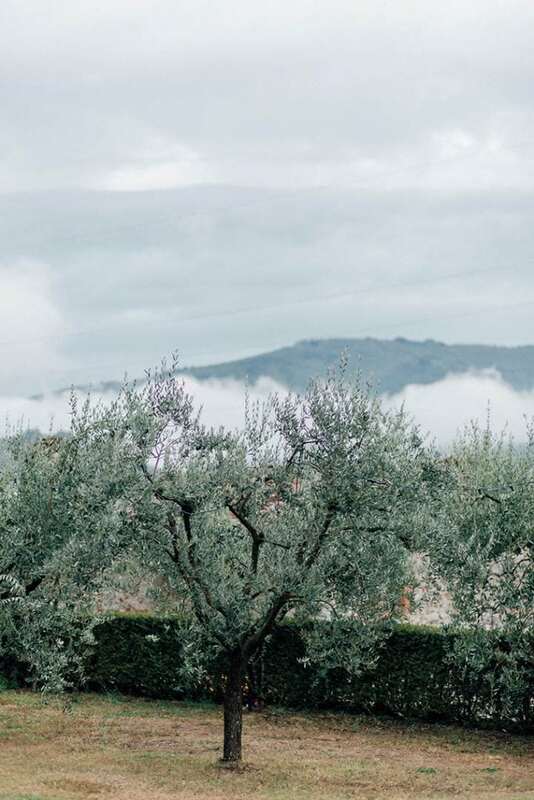 In the middle of the Italian countryside, between luscious Tuscan hills, revegetated with olive groves as far as the eye can see, lies Villa Catureglio. 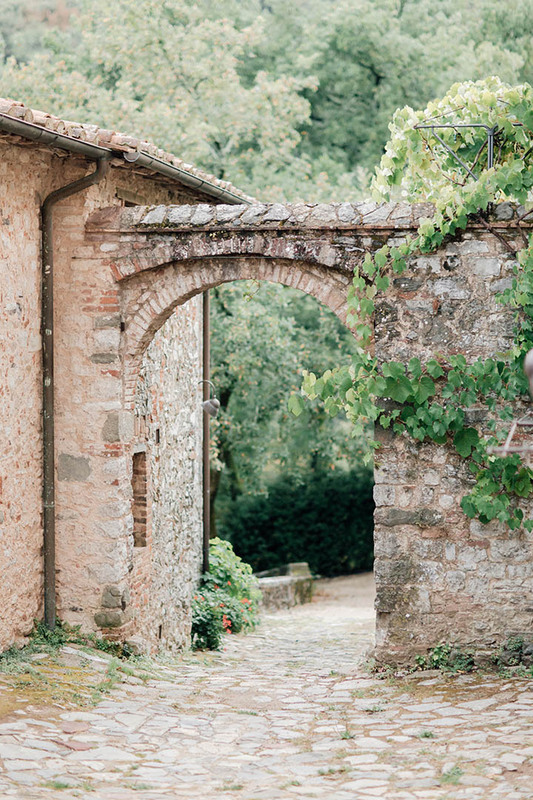 This sleepy historic estate seems to dream a dream of centuries past. 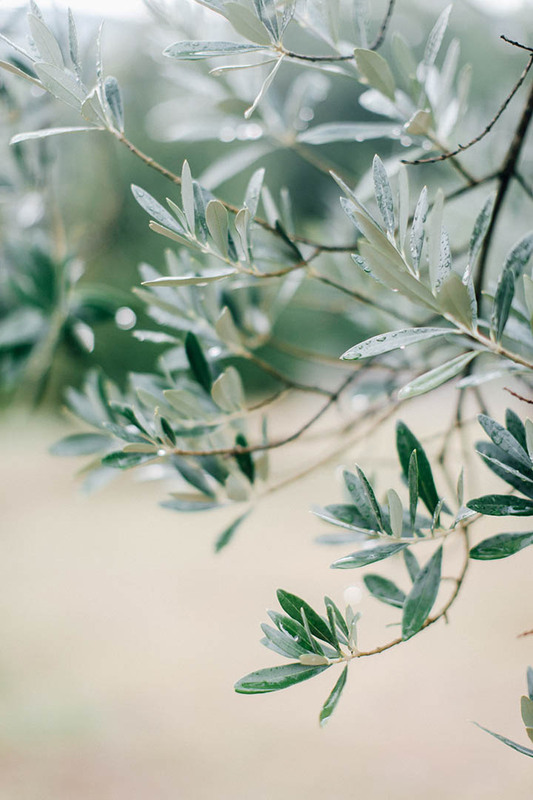 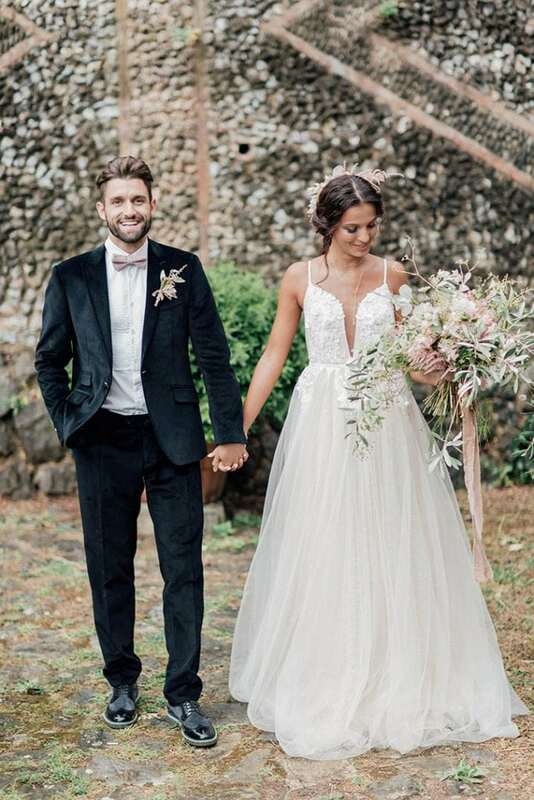 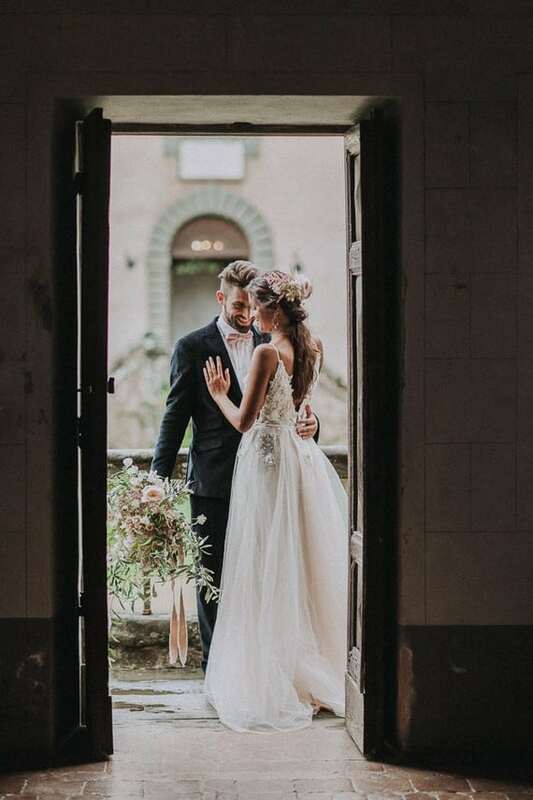 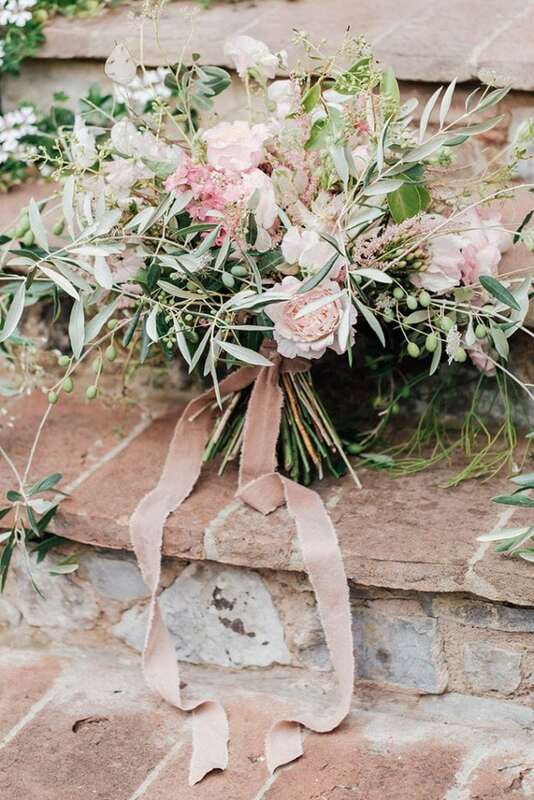 For our styled shooting with Octavia + Klaus and Milles Fleurs we woke it up from it’s sleep, turning the villa into a beautiful Tuscany destination wedding venue. 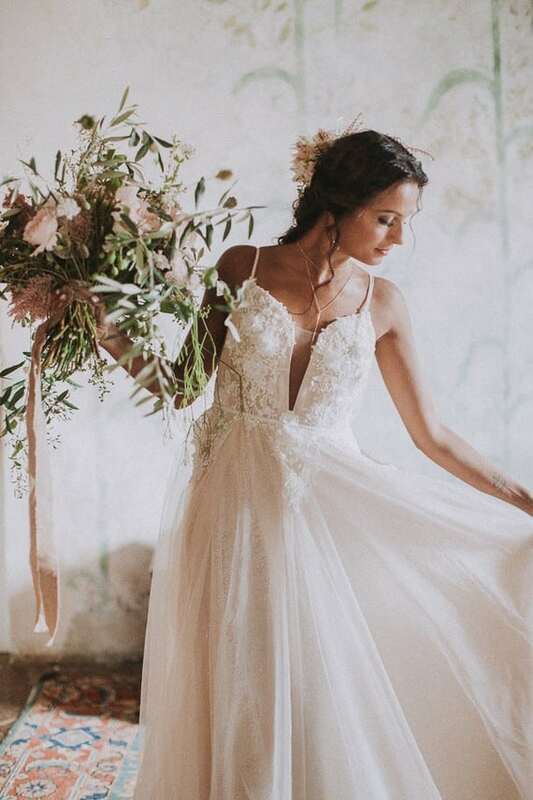 The styling is very modern and romantic yet understated, featuring a wedding dress with deep cut-outs in the back and front of the top. 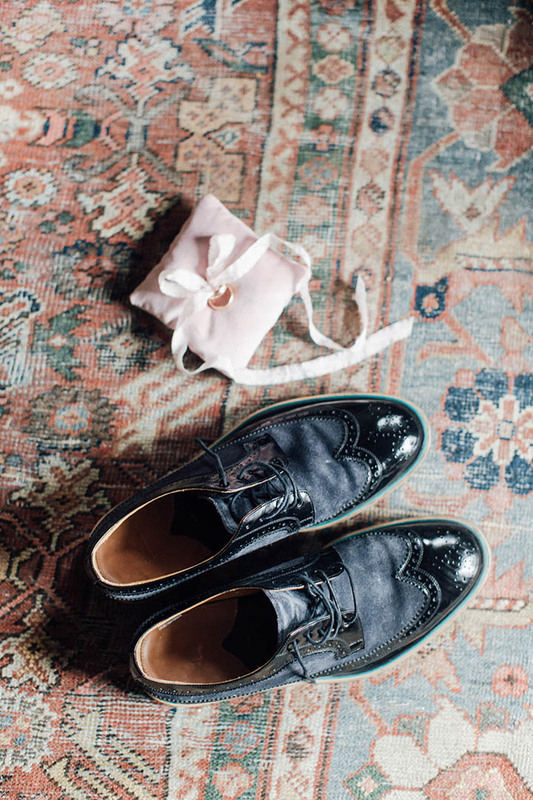 Very thin straps and a lace overlay underline the modern feel. 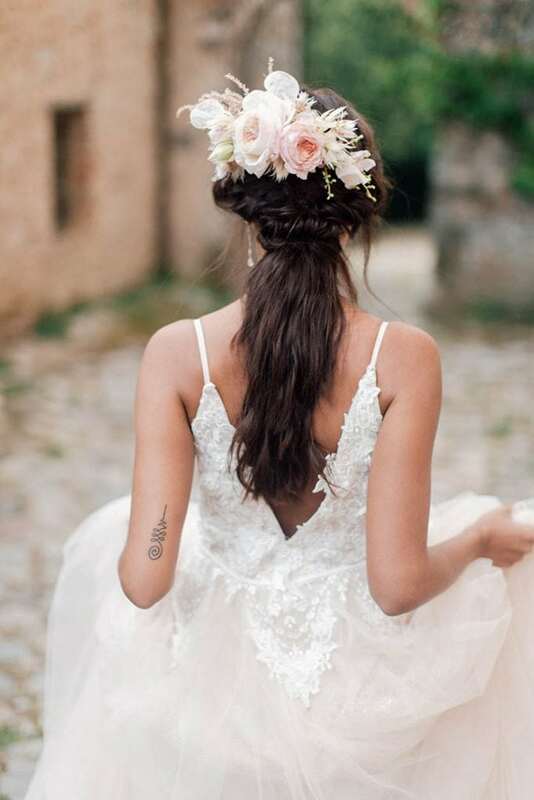 A romantic feel is added through the loosely braided hair and a floral headpiece in soft peachy hues. 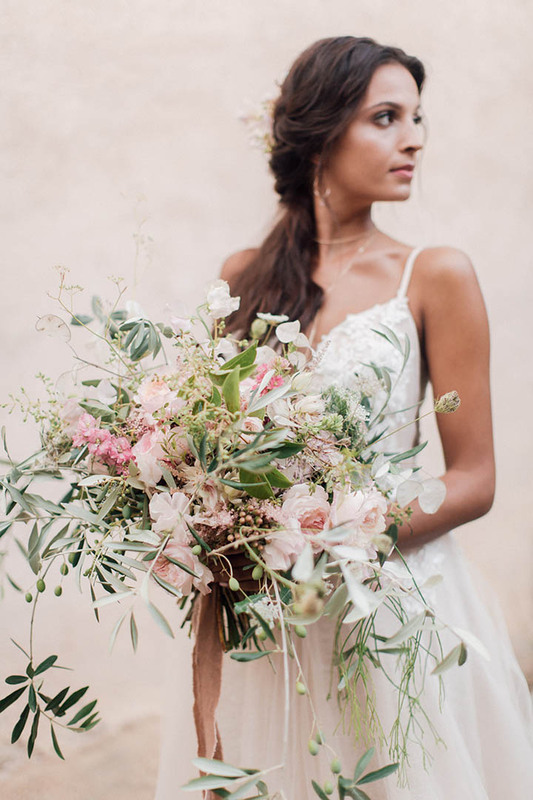 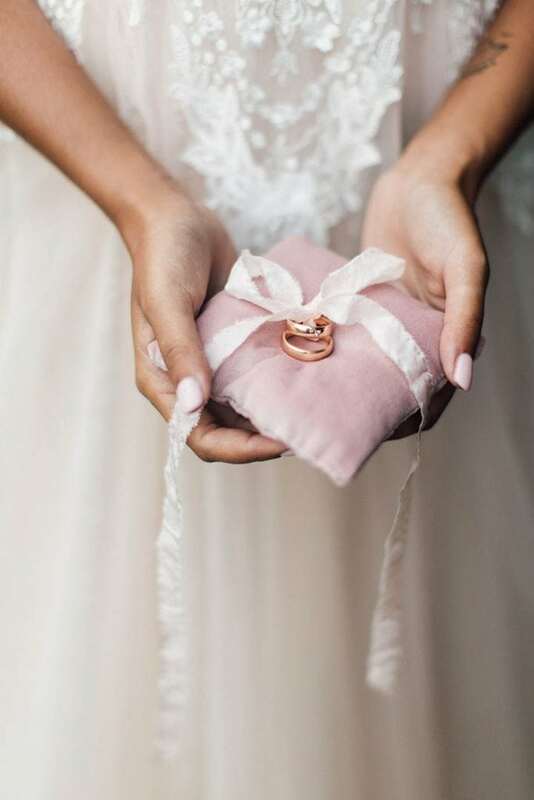 The bride is wearing dainty golden earrings and a necklace, that don’t overpower the fairylike look. 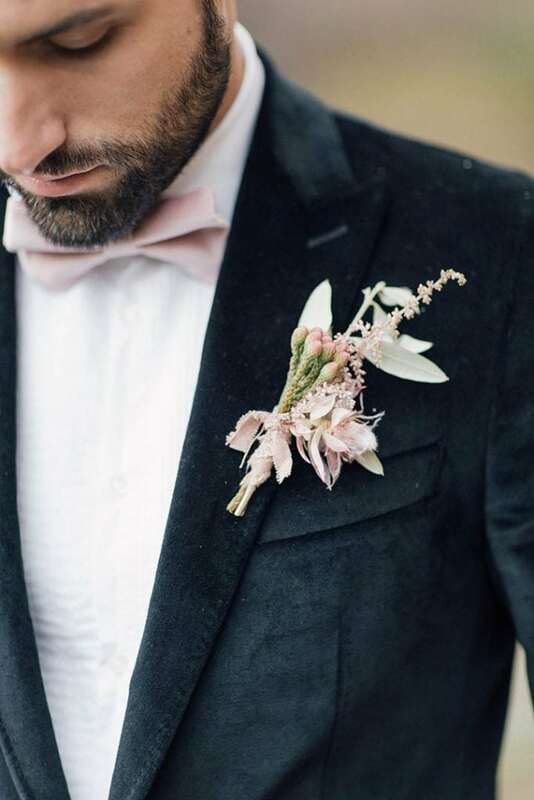 A dark velvet suit combined with accessories in blush tones create a groom’s look that works exceptionally well with the bridal styling. Naturally the olive grove acted as the venue for the wedding dinner. 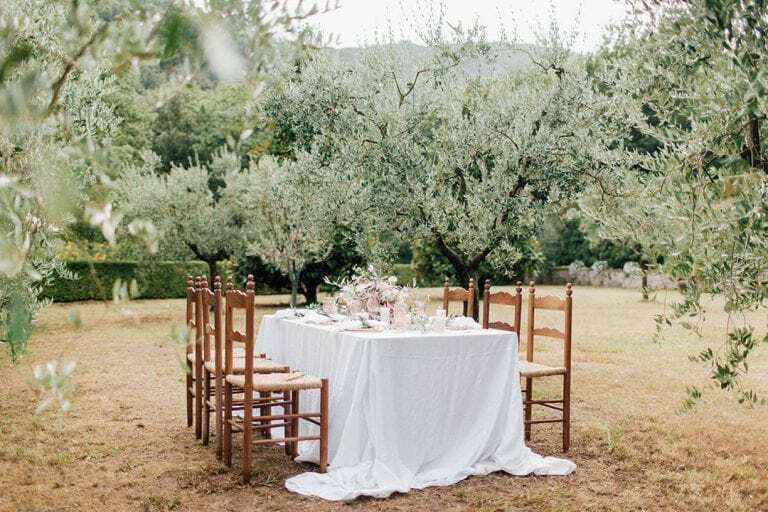 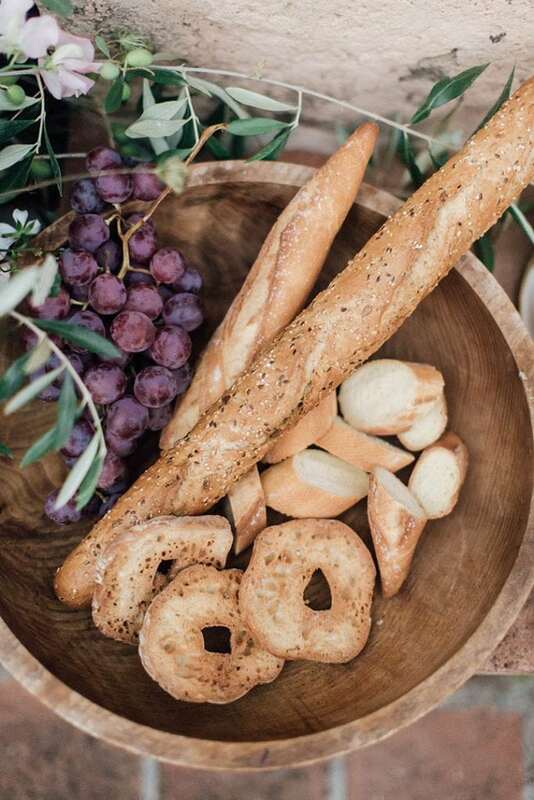 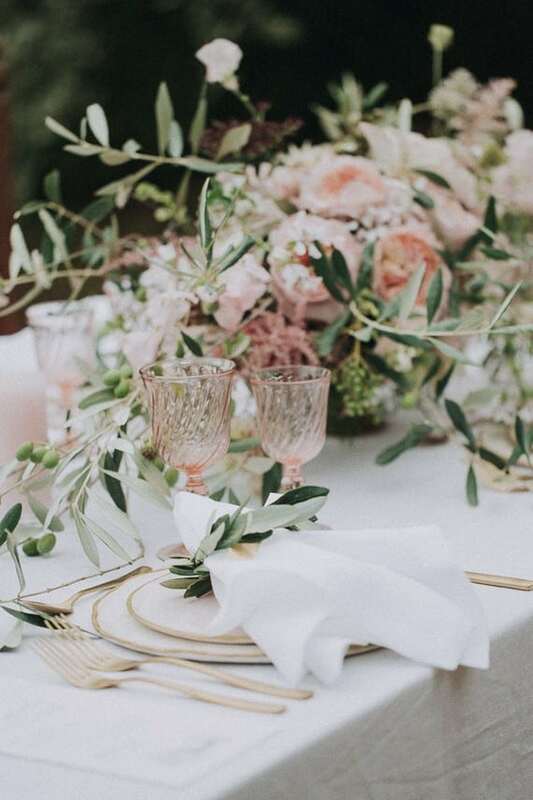 A table and rustic wooden chairs were set up beneath the olive trees. 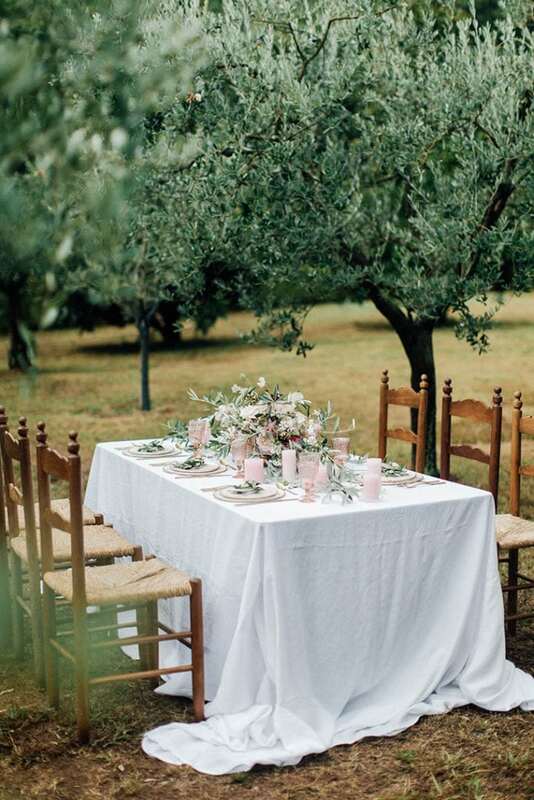 We added a white linen table cloth that pools on the ground, golden cutlery and handmade ceramics. 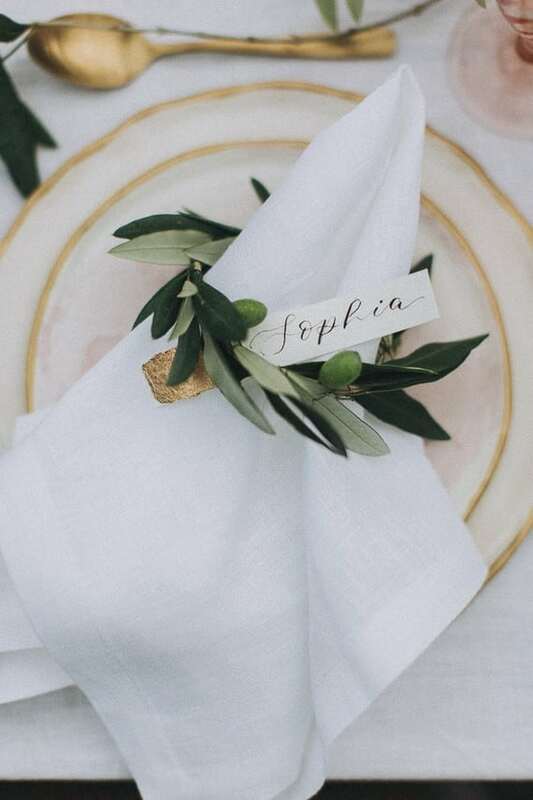 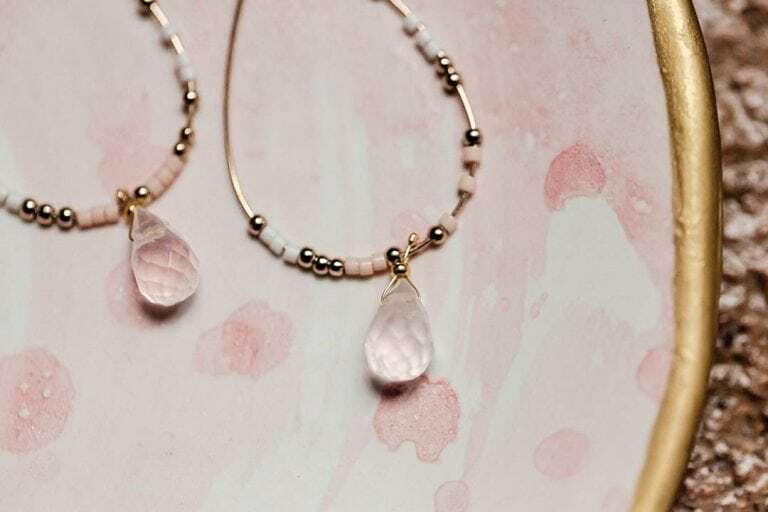 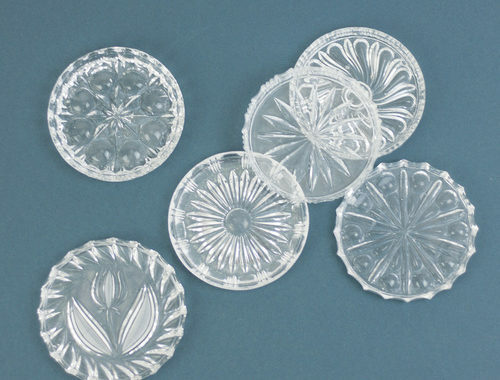 What is special about these plates is their organic shape and beautiful light pink watercolor pattern. 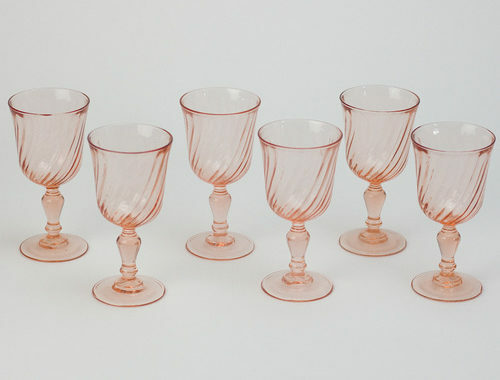 Pink swirly wine glasses from the 1970/1980 in France and elegant brass candle holders round off the fine table styling perfectly with beautiful details. 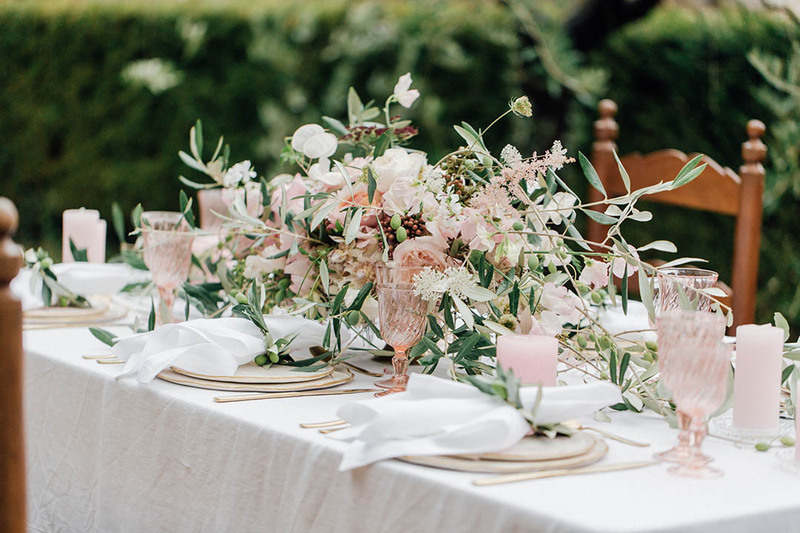 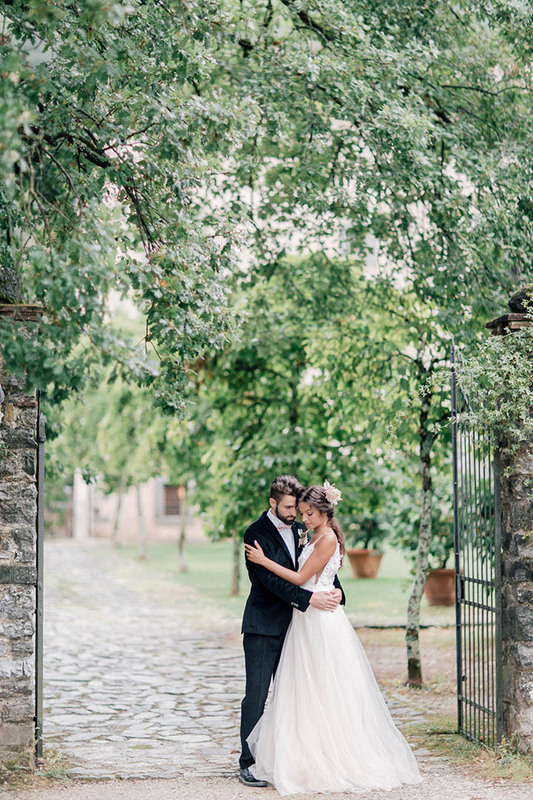 The floral concept behind this dreamy Tuscany destination wedding is garden- inspired. 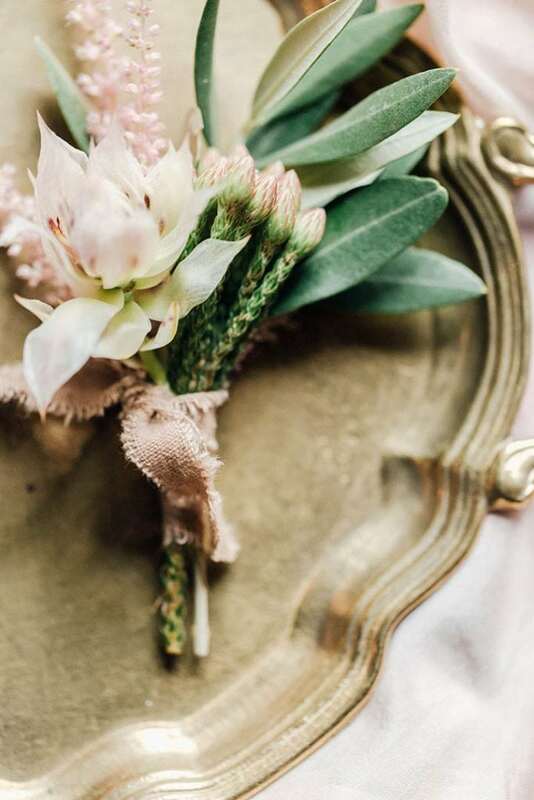 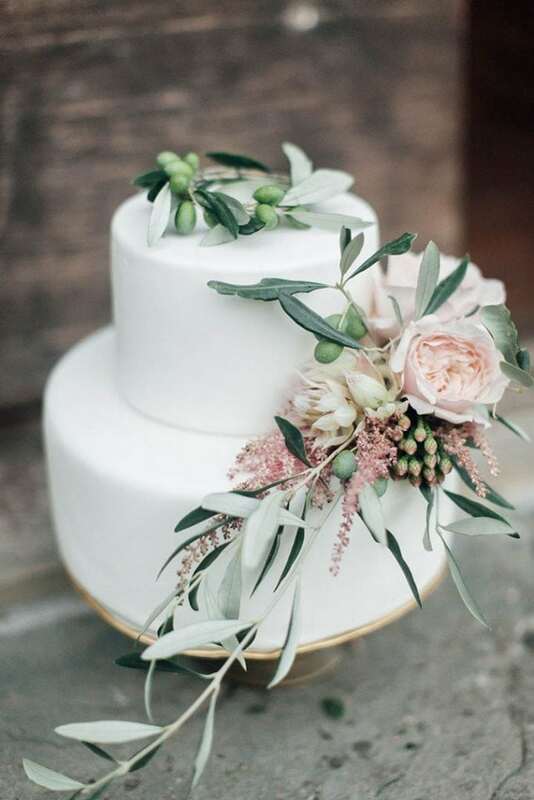 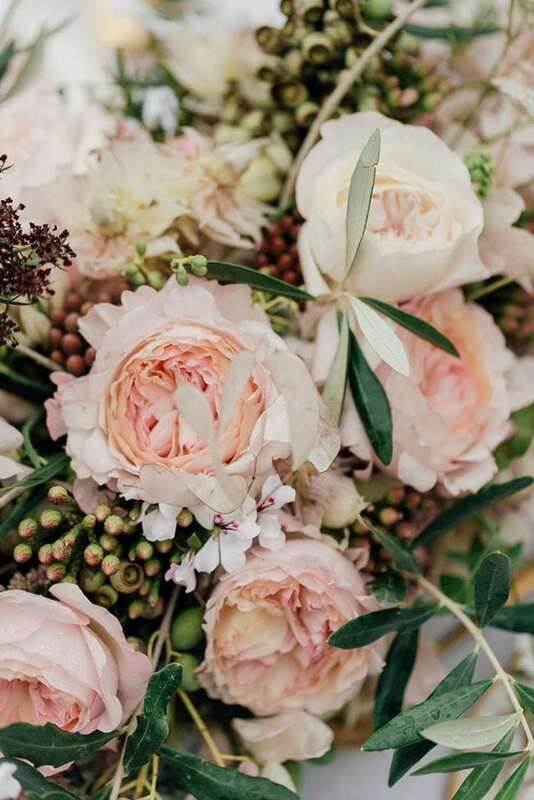 What makes the floral design special are the lush olive twigs combined with english garden roses. 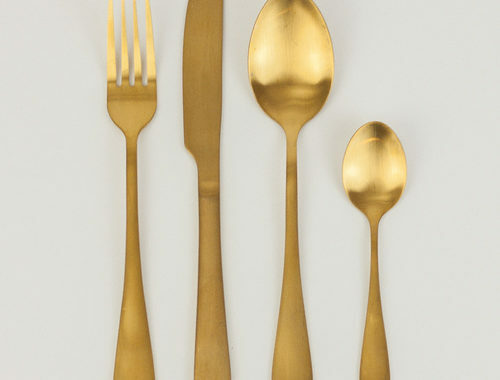 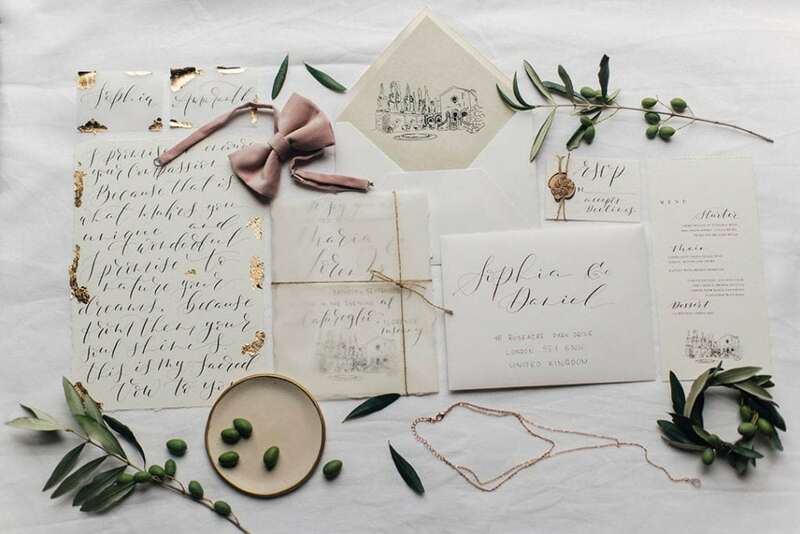 The golden details which could already be spotted in the table styling make a comeback with the stationary. 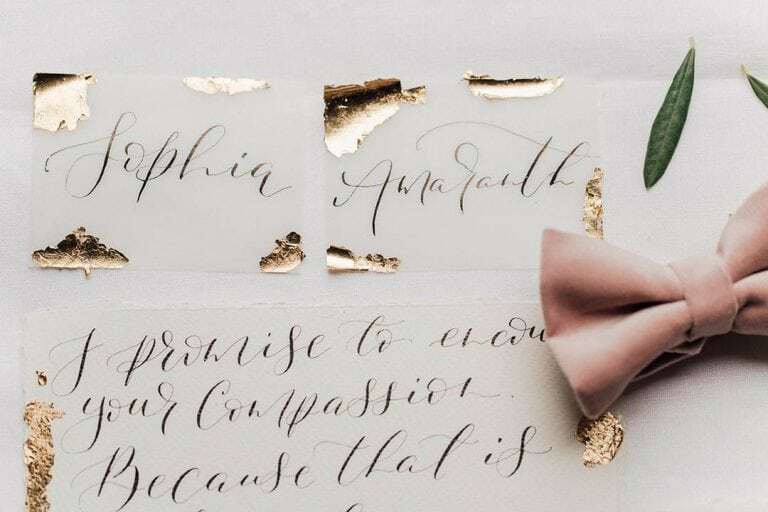 The romanticly calligraphed font is accented with gold leaf. 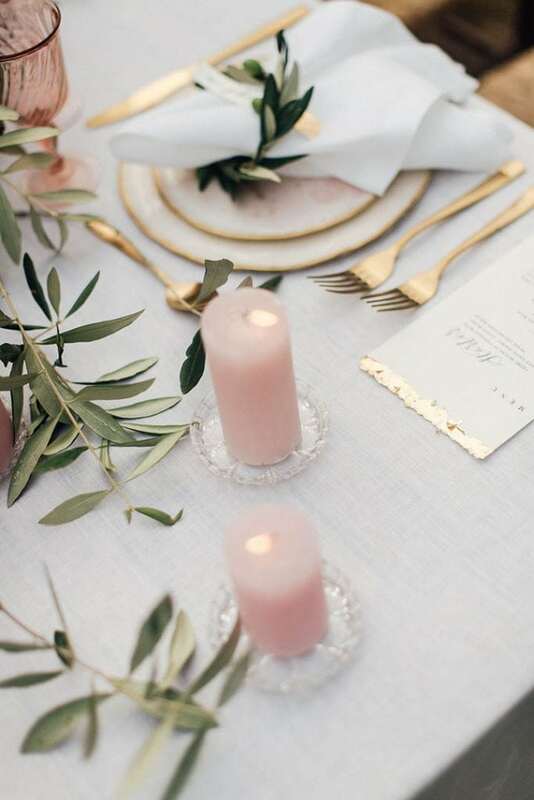 The combination of gold with lush olive tones creates a very harmonious look that fits this Italian destination wedding like a glove. 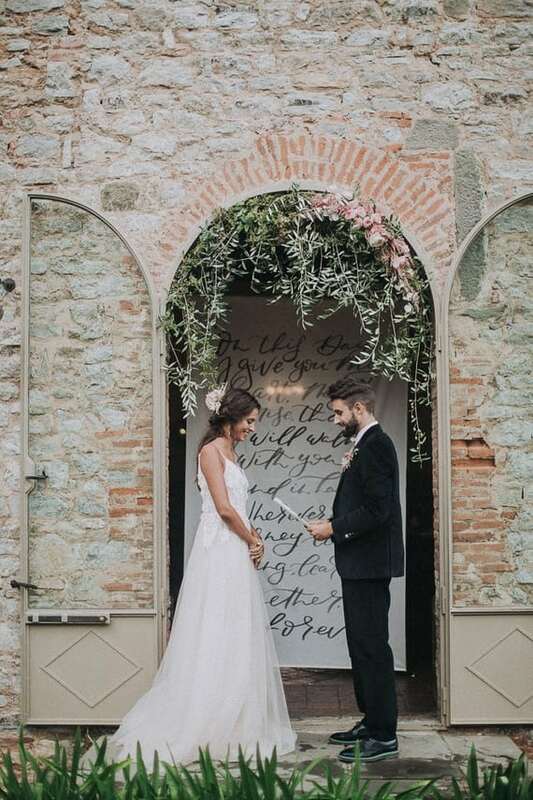 For this Tuscan dream wedding Maria Shtelle created not only magical calligraphy for invitations and menus, furthermore she designed a stunning backdrop for the wedding ceremony. 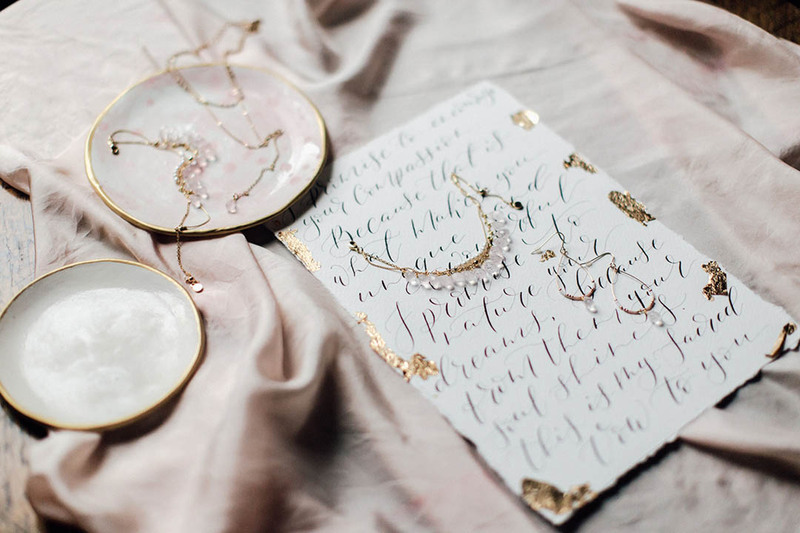 The airy cotton mousseline is almost transparent and features a poem close to the bride and groom’s hearts. 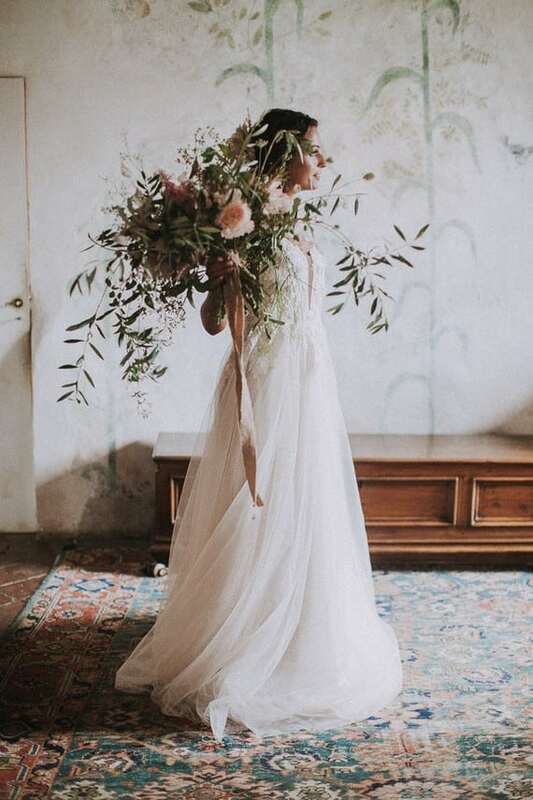 Such a lovely idea if you are looking for a unique alternative to the classic wedding arch. 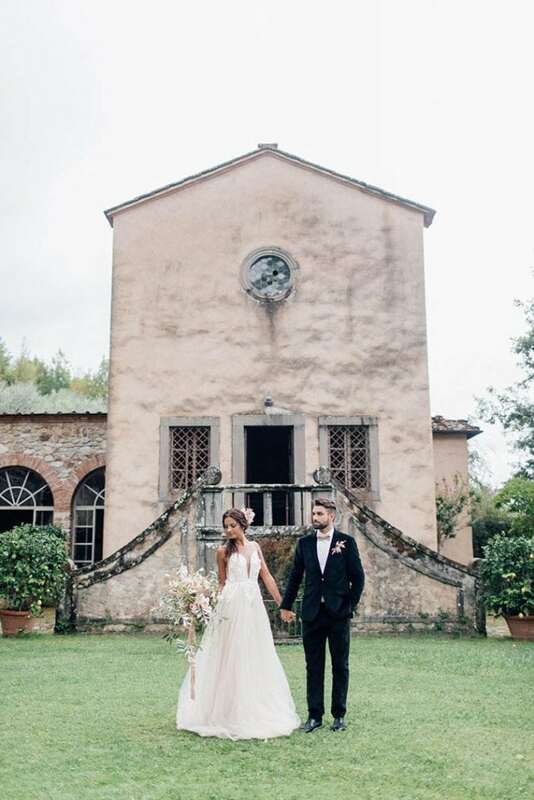 Would you like to get married in Tuscany? 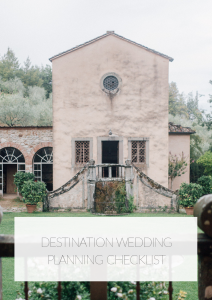 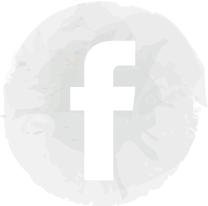 Check our overview on the best wedding venues in Italy for your destination wedding in Italy.